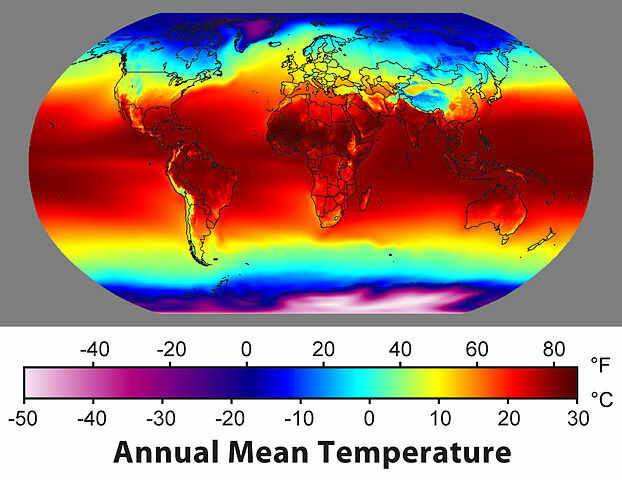 Temperature is a measure of the internal thermal energy state of a substance. It represents how much vibrational energy exists in the molecules of a liquid or solid, or the translational energy (speed of movement) of molecules in a gas. There are various temperature scales for measuring temperature. The one used by scientists is the Kelvin scale. Absolute zero (0 K) represents absolutely no thermal energy contained by a substance, a point which is impossible to achieve. The freezing point of water is at 273.15 K, and the boiling point of water is 373.15 K. The Celsius scale of temperature is just the Kelvin scale with an offset of 273.15, that is, referenced to the freezing point of water (273.15 K = 0 deg. C). On the Fahrenheit scale, the freezing point of water is 32 deg F, the boiling point of water is 212 deg. F, and absolute zero is at -459.67 deg. F. (see How do you convert temperature? for conversions between Celsius and Fahrenheit). Understanding temperature requires understanding energy as well. The temperature of a substance will change depending upon the rates of energy gain and energy loss. Generally speaking, the rate of energy loss is very temperature dependent. Once something reaches a higher temperature than its surroundings, it loses energy to its surroundings at a rate that increases with that temperature difference. A constant temperature usually means there is energy equilibrium, with equal rates of energy gain and energy loss. COOL! : The hotter something becomes, the faster it loses energy to its surroundings by various heat loss mecahanisms. In the case of infrared radiation, that loss is proportional to the 4th power of its Kelvin temperature. For example, if a substance doubles its Kelvin temperature, it will emit (lose) infrared radiation at 16 times the rate (24) as before its temperature doubled. Your skin is sensitive to this "heat" radiation, which is what you feel at a distance from a stove, fire, pavement in the sun, etc.